Spring is probably my favorite season, and it is particularly beautiful here in Atlanta – “the city in a forest”. The windows of my home “office” offer views of budding trees and flowers all around us, and I noticed this morning that the peonies in the front yard are even starting to emerge. The longer days and warming temperatures bring us back outside, whether it be to play in the neighborhood or in the first few games of the new baseball season. Spring is also well-known for another reason – Spring cleaning. Almost on cue, neighborhoods come alive with the sound of lawn equipment, and open garage doors offer a glimpse into decluttering, organization, and cleaning after months of cold. So, I began to wonder: what exactly are we, collectively, cleaning? And why does it have to wait until Spring? If you’re like me, I notice cobwebs and leaves that make their way into our garage during the winter because of the break I’ve had from yardwork. But why the sudden appearance of all this other “stuff” that seems to materialize on curbs during March and April? Perhaps it’s unused or no-longer-wanted gifts from the holidays, or things we impulsively buy when we’re cooped up inside in the cold winter weather. Either way, it’s shocking that, year after year, there seems to be more stuff to discard or (hopefully) donate. If we didn’t buy all the stuff, there’d be no reason to have to clean it, organize it, or get rid of it! Clutter was the trigger that set off a chain of events that has gotten me to this point on the journey to financial independence through simplicity and minimalism. In the months after our son was born, we had stuff EVERYWHERE. Bottles, toys, play seats, you name it, and it was covering more surfaces than not in our house. I was depressed and anxious and, for a while, I honestly didn’t know why. What I didn’t realize at the time, but came to understand later, is that clutter is scientifically proven to cause both depression and anxiety – it taxes you mentally when you may not even realize it. For me, it made me irritable because I was surrounded by it. When you come home from a long day at work, the last thing you want to see is crap everywhere. I think I found a way to deal with it at first, but the cumulative effect became toxic. I continually asked myself, “What do we do with all this stuff? Where do we put it? When am I going to have time to pick it up and organize? Why do we have all this stuff to begin with? ?” And, if you’re a neat-freak like me, clutter adds insult to injury because it requires cleaning or dusting! Is Organizing Really the Answer? We eventually got a little better about organizing all of these items, but that still didn’t solve the problem. And let’s talk about organization for a minute. When you take the time to organize your stuff, are you really just shuffling and re-boxing things so rooms look tidy and neat, or are you intentionally considering each item you’re dealing with to determine if you even need to keep it at all? For a while, it was the former for us. Up until last year, when we finished our basement, we’d periodically rummage through what was in storage down there, but we never really did anything about it. Sure, we might find a couple of things to donate from time to time, but we mostly just moved stuff around and left it to be dealt with “later”. At that time, that half of the basement, and some of our garage space, were the extent of our storage so, when we decided to put the space to use as a TV room and bathroom, we were forced to part with it. It wasn’t easy because the sentimental nature of people may cause us to look at something 3, 4, or more times before we finally pull the trigger to remove it. We came across all kinds of things from our childhood years, many of which we didn’t even know were in those boxes. Sure, we held onto a few mementos but, even now, I couldn’t even tell you what made up the items that we either discarded or donated. Must not have been that important in the first place! I’m pleased to report that, even without the basement storage space we lost, we’re still able to get both cars in the garage, and we don’t rely on a self-storage facility. Speaking of self-storage facilities, they seem to be popping up on every corner here in Atlanta. I did a little research and came across some alarming statistics. Not only do almost 1 in 10 of us have a self-storage unit, but we’re paying an average of $87 per month just to keep our things in a warehouse! And this article puts it another way by pointing out that there are now more self-storage facilities in the US than there are McDonald’s restaurants! Marie Kondo’s method, outlined in her book, The Life-Changing Magic of Tidying Up, says that if an item doesn’t bring you joy, then get rid of it. While some articles or books recommend that you go room by room to declutter, Kondo says to gather items by type from across your home or apartment. For instance, you’d get all of your clothes together, even though they may be stored in multiple closets. Only then can you really see the whole picture. And she suggests holding each item individually, not just a cursory look at the pile before moving on. And if you really want to have some fun with decluttering, read The 100 Thing Challenge, by Dave Bruno. Granted, it’s not very realistic (and even the author admits as such), but it’s a fun read to at least get you thinking about it. If you had to choose, what 100 things would you pick? A major premise of the book is that we keep things we’ve never used, or rarely used, “just in case.” How many times have you said that about something and put it right back where it was and never use it? But clutter doesn’t have to be just physical. Think beyond the physical clutter for a moment and ask yourself, “What mental clutter am I carrying?” Is it worry? Is it regret from past actions or decisions? Is it anger or resentment? Whatever it is, it’s filling the basement, corners, and closets of your mind. Put another way, try your best to clear the mental clutter and get on with your life. I think I’d be remiss if I didn’t at least touch on the newest form of clutter – the digital variety. While younger generations are hopefully starting to see that experiences, not things, are the key to long-term happiness, there’s a whole other world out there when it comes to data, emails, photos, videos, and social media. My wife recently commented about the amount of spam in her inbox. I told her to take a few minutes and unsubscribe from each and every email she didn’t want to see anymore. She did, and commented a few days later that she no longer dreaded checking her email! Since many of these emails are advertisements anyway, you not only have fewer emails to wade through, but you’ll be less tempted to impulsively buy something you don’t need! From time to time, I’ll also go through and purge photos and videos from my phone. I often find duplicates, blurry pictures, or shots that didn’t turn out like you’d hoped. And ditto for email – I’ll occasionally look back through my emails to find old emails with information that I no longer find pertinent, or that contain links that are no longer valid. I began my blog posts with the word appreciate, because I don’t think we do enough of it in general. If we appreciate what we have, there’s not a constant need for more or better. And when you don’t have that urge, you’re not spending money of stuff you don’t need! I recently read an article citing a survey that says nearly 60% of young adults say social media is influencing what they buy. Just think, constantly comparing ourselves to others can easily lead to all three types of clutter – physical, mental, and digital! 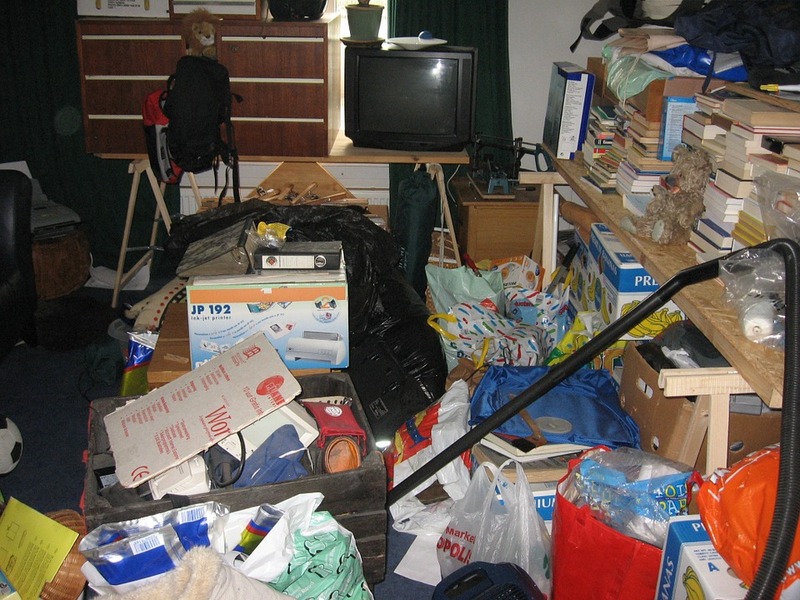 What clutter can you eliminate? Carve out time in the near future to rid yourself of something that’s causing you anxiety or depression. Free your energy for something more productive and joyful! Personal finance coach and mentor. The Ate Truths is a lifestyle focused on personal freedom, happiness, purpose, and impact.